Guillermo del Toro is a genius. It takes a director of his caliber to capture the quirkiness of the comics and transfer it to the big screen. The film works on every level – funny, exciting, odd, and wonderful. Hellboy is crude, funny, and answers to no one. He also has a soft side, as evidenced by his affinity for cats. Powdered Toast Man from Just the Cheese! PTM (real name, Jamie) knows how to push the limits without going off the edge. (Not too far, anyway.) He has a wicked sense of humor and a go for it attitude. He’s also a devoted friend and quite the innovator. Jamie, you are still one cool dude! And you keep me young. PTM/Jamie is a newlywed, a comedian, and occasionally attacked by birds who are after his toast head. Did you know that Powdered Toast Man, a character who appeared regularly on the Ren and Stimpy Show, was based on a Frank Zappa inspired character called Studebacher Hoch? Who plays Hellboy’s father in the movie? Cassie Mae just signed TWO book deals! She has a three book deal with Swoon Romance, for her YA books, starting with How to Date Nerd, coming this September. And she has a two book deal with Random House FLIRT for her NA books, starting with Friday Night Alibi, coming July 29th and Pulling the Switch, coming this December. Congratulations, Cassie – big score! Next Monday is the release day for Flights of Fiction, published by Handcar Press, and one of the eleven stories in this anthology is "Motive" by LD Masterson. Congratulations, LD! Also, due to blogging situations, two people have new blogs – A to Z Challenge co-host Stephen Tremp and Yvonne Lewis. Fan of Del Toro or the Hellboy series? Following PTM? Ever heard of T-Ride? Know the trivia answer? Excited for LD and Cassie? Think we should start betting how long it takes the featured blogger to find this post? Wondering how many clones I’m going to burn out this month…? Yay for Cassie Mae! I'm so happy for her! I've never seen Hellboy. I thought I had but then I saw the pick and I'm like, no... i think it was some other red dude, but I don't remember what it was, lol. And thanks for the shoutout! I'm still bouncing from all the excitement! Yep, I love Hellboy. He's a cool character, though I've never read the comic. Yay I'm here early today! Massive congrats to Cassie. Don't know how all you A-Zers are keeping up with things at the minute - respect! Seems like fun though. I liked Hellboy, he had just enough attitude. He also had a soft side for his lady. No idea who played his dad. It's been a while. I really enjoyed Hellboy and I think John Hurt played his father?? Not sure on that one, though. PTM is always coming up with creative characters for his blog. Congrats to Cassie Mae! I need to check out Powdered Toast Man. I hadn't knew anything about Hellboy before I watched this movie. It was a great - very positive - suprise to me. I loved it! Hi Alex .. I know absolutely nothing about these Hs ... however wonderful deal for Cassie May - she must be over the moon. Thanks for letting us know re Stephen - he's had awful problems recently ..
You missed a hero - Ninja Captain Alex! Still have never seen Hellboy! After reading this and a few of the comments here, I'll have to check it out! Big Congrats to Cassie on the 2 book deals!!! Whoa, big day for Cassie! I've seen Pan's Labyrinth and The Orphanage, both del Toro movies. What are your thoughts on these two movies, if you've seen them? Another great film Alex!! And what a great album Porngraffetti was, I didn't buy that many albums back then, but I did buy this one. Alex Didn't Hellboy also have a thing for the girl with the dark hair, it looked like he was in love with her! Well done Cassie Mae, will stroll over to Stephen and Yvonnes blog, blessings for the week! I love Hellboy. I remember some people questioned it's success as a movie but when I saw the movie I knew it would be awesome. Congrats to Cassie, I'm so happy for her! I remember reading her blog before these book deals and how nervous she was. Well have no fear Cass. I liked the first Hellboy film!! John Hurt played his father!! The second Hellboy was so so...! Powdered Toast Man, now that's a guy I don't know. Heading over. Big congrats to Cassie! She's having an excellent year! I think I've watched most of Hellboy because my hubby and son have watched it more than once while I've been around. Never watched it from start to finish, though. i always mix up Ron Perlman and Tom Waits. Just me? Congrats, Cassie on those contracts! May the sales gods bless you immensely. Hooray for Cassie Mae! I'm not a fan of Hellboy, but I am a fan of Ron Perlman. Yay for Cassie Mae! That's so exciting! I love PTM, he is so hilarious and yes, very reminiscent of Hellboy's attitude. Del Toro is such a craftsman, and I wish we'd gotten to see his take on The Hobbit. To be able to play with Hellboy while also making the exquisite and excruciating Devil's Backbone is something else. Here's hoping Pacific Rim holds up! That was a sweet bit of Zappa trivia, I learned soemthing new today! And you foreshadowed my Z post. Alex...what an excellent theme for the A-Z. I'm really bummed that I had to drop out, especially now that I'm feeling a bit better. But to everything there is a season. I'll definitely be a part of it next year. I just didn't think I could do much visiting. Oh...and you'll be #2 to be spotlighted. I wrote that in my comment back to you, but don't really know if you go back and check. Man, I don't see how you get around the first time, much less any follow-ups. I appreciate you more than I've told you, but the spotlight will! Awesome news. Can't wait to read LD's story. Mark, correct, and say no more. Michelle, I just hope they don't go on strike! Cynthia, Labyrinth was depressing but excellent. The other one was good, but he only produced that film. Ray, you have good taste. JL, you won't miss me? John, Del Toro can do no wrong. I always thought Hellboy was surprisingly good. A fun movie to watch. Hellboy is pretty steampunk. So, I'm a fan. Lol... Loved the clone burn out comment! Congrats to Cassie and LD! Love to hear such great news if our blogger friends! ML, next year! And thanks - appreciate that. You're still going strong. I can't even imagine. I'll have to check out PTM. Major congratulations to Cassie Mae! And I love your choices for heroes. I admit Hellboy is not my favourite, but he's cool. And Jamie is hilarious! I barely remember Hellboy since I watched it long ago. Who am I kidding? I don't remember movies I watched last month. Yes, excellent Heroes and Villains by T-Ride, good song. Wow! I might have to give Hellboy another chance. I really didn't like Ron Perlman much but he's grown on me watching Sons of Anarchy. Cassie Mae is rolling in good news! PTM is crackin' me up daily. Yay Cassie! Powdered Toast Man is hilarious and leave really funny comments, too. Hellboy is a great example of the "save the cat" writing concept. Hellboy! Yeah, really enjoyed that movie. And no, been a while since I saw the movie - didn't read the comics *ducks to avoid tossed soft object* but don't know who Hellboy's dad is. I love Ninja News. It is always fun and exciting to see what is happening! Congrats to Cassie Mae! I haven't seen Hellboy. I'll go check out Just the Cheese. And thanks for telling us that Stephen had moved. Congrats to Cassie Mae! And I am amazed at your seemingly endless clues. Do you ever sleep? I own the Hellboy movies; for a while, my kids were even on this big Hellboy kick started by my -daughter-! It was amazing material in the first place, but del Toro made it even more spectacular. Congratulations to Cassie Mae. That's great news. PTM is also noted for his Pop Tarts. I don't know Hellboy, but if he likes cats I guess I should be acquainted. Just the Cheese? What a fantastic blog name, going to check it out! Rock on Cassie Mae!! So happy for her. (1) Hellboy is the shiz. LOVE him. (2)Already follow PTM. He is the cheesy shiz. Haha-What the Cheese cracked me up. Super thrilled for Cassie Mae! Powdered Toast Man? Now I've heard it all! Hilarious! I figure you don't need any clones because you are THE NINJA! "More than Words" is one of the most romantic songs...I think. Hellboy creeped me out a little, though his affinity for cats was endearing. I enjoyed PTM's site all the time I got to read it but for some very odd reason, his site triggers my anti-virus alarm. I don't know why. It happened once with Cherie Reich's site but it fixed the next day. But it doesn't seem to fix with PTM's page. Considering casualties already? Come on! It's only the beginning of the second week. We'll talk about funerary pyres by the 22. No earlier than that. I've never seen Hellboy, but thought of you last night as hubby and I trolled for movies and started watching Fantastic Four. I actually liked it. Hellboy's real dad... or the one he refers to father ? Del Toro is one of those directors whose movies I either love (Pan's Labyrinth) OR avoid like the plague (Mama)! Such a great imagination and I was truly stunned that he did The Hobbit. That is wonderful news for Cassie Mae. I hope everything goes smoothly for her. Congrats to Cassie on her book deals! Fabulous news!!! I'll have to check out PTM's blog. A real life Hellboy is too hard to resist. :) Yay for Cassie and all her fantastic news!!! Now, who wants a happy helmet? I am a fan of Hellboy. Can't wait for LD's book. The idea of signing two book contracts makes me feel anxious...it's very cool and big congratulations to anyone who can handle the pressure, but I think I'd end up stressed to the max. I loved Hellboy. Congrats to Cassie. Wow! So excited for Cassie! Well deserved! I was a bit confused by PTM. I knew I'd heard of that name before. Ren & Stimpy, of course! And I thought I was the only one who listened to T-Ride! My favorite song is Zombies From Hell, because they're much scarier than zombies from Earth. The Hellboy movies were great, too. Congratulations to Cassie Mae - that's awesome news!!!! I did like Hellboy, though it never became a favorite of mine. Never read the comics. How are del Toro's books? Have you read any? huge HUGE HUUUUGGGGEEE Fan of del Toro. Hellboy rocked! A great "H" movie choice! Having toast for a head would be an invitation for birds I suppose. They do have a fondness for crumbs. I never heard of T-Ride but I heard of Hellboy with Perlman. Wow, congratulations to Cassie! And I didn't know about LD's inclusion in the anthology, that's awesome. Can't wait to read it. Jeremy, you're sharp - who hw refers to as his father. Charles, read one. It was "OK."
WOW, I've never heard of any of the movies you mentioned. I've never considered myself a comedian. I have always thought I was funny but not a comedian. That makes me feel all warm and fuzzy inside or that is the alcohol. Thanks for picking me as one of your A to Z featured blggers. Cassie Mae, how exciting for you. I'm really esctastic for your success. I hope you have the books already written, for deadlines are harsh mistresses! I like Hellboy, both comic and movie! love hellboy! such a crazy story! Excellent casting of Hellboy. PTM is it! LOL. Nice. Powdered Toast Man rocks! he has to stay out of the rain though or his head gets all heavy and falls over:) Great shout out and I enjoyed Hellboy and the others that follored. Ron perlman is a great actor. I can not remember who played his dad though. I love Hellboy! And wow go Cassie!! Yay! Goodness, Alex, you play complicated. What fun! Met PTM yesterday. Funny guy. It is fun to see whom you're featuring each day. You are so kind. I like the Hellboy series! Many congrats to Cassie Mae!!! That is awesome. 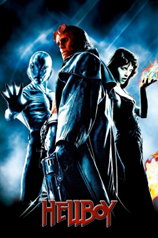 Hellboy 1 and 2 were fantastic films, I must re-watch them. Massive congrats to Cassie, though goodness knows where she finds the time and energy for all she does! Yay to adorable Cassie Mae! Who is also just too darn cute! I love Hellboy. My kids grew up watching Beauty and the Beast. What an awesome show. Just goes to show Heroes come in all shapes and sizes. The only thing I know about Hellboy is that he (it?) was mentioned on the Big Bang Theory. Needless to say, I have never heard of Hellboy. Hellboy is an awesome film! Must check out PTM. I'm thinking at least a dozen clones a day. At least! HA! Very unique choices. Great post! I love the Hellboy movies. I think I am attracted to the dark sarcasm. lol! PTM, you're welcome, and I think you're a natural comedian. DL, I did as well. Mary, still three more weeks of introductions! Christine, I hope they don't quit that fast! Congrats to Cassie Mae! Is this cheese guy the same one that used to be Cheese Boy? Because that blog was hilarious and I haven't seen it around for awhile. I'm a massive Guillermo Del Toro fan, and also consider Hellboy (and its sequel) to be one of my favorite comic book adaptations of all time. Ron Perlman, who is apparently 62 or 63 years old. Fan of both Del Toro and Hellboy. Haven't seen Hellboy in a looong time. Cassie's news is awesome! Still have top see HellBoy! everybody says that's great but i didn't really take their word for it before. I liked the Hellboy movies. I loved all his kitties. We have that T-Ride CD. On our one year anniversary, my husband called the local radio station and requested Zombies From Hell. Yes, very romantic! Those Hellboy movies are great! I'm yet again astonished by how many people I do not know. All I know about Del Toro is that he almost directed The Hobbit films. I've never actually seen anything he directed. Great to know about the book deals and publications! I actually got yesterday's trivia question correct. How about that! I have no clue about today's answer, so we are back to par. Congrats to Jamie for the shoutout. I can't believe I actually already follow both Cassie Mae's and LD's blogs. That is a first! I actually knew both bloggers you were hyping!!! I think my mind is blown. Karen, no that was Abe. He's focused on Facebook and Twitter now. Sotet, he was just in short bit commercials. Don't remember if it was later shows though. Golden, you need to watch one of his movies!!! Robin, no - you need your mind! Awesome news for Cassie and LD! So exciting! I never saw Hellboy, but it sounds cute. The comics I read growing up were the Archies and Casper, lol. No superheroes. And toast head? LOL! Ah yes, what the "Hellboy". And I understand the frustration that Stephen and Yvonne have been having. And yes I 'follow' PTM. We have to find a better word than "follow". Be well, dude. Happy alphabeting. I won't lie. The image of PTM really freaks me out. lol He seems pretty cool, though! I've never read the Hellboy comics, but I'm getting into comics now and Hellboy will be one that I pick up! What a great theme. Lots of variety and interest. Holy crap look at all these comments! I forgot I already stopped by today, lol, but I'm so glad I came back. And Roland... no, not all of them are written. YIKES! LOL. Congratulations to Cassie and LD! That's awesome news. Oh my gosh, I haven't thought of Ren and Stimpy in ages. I need to find that show and watch a few episodes. LOVE Hellboy! Del Torro is an awesome director. Hellboy is a cool character. He so different from the outside cannot be more human from inside. Huge news. Congrats to Cassie Mae. I liked Hellboy and Hellboy II. Such a keep it real kind of character. Congrats on your feature of PTM soon to be a papa! Great choice. Thanks for mentioning Stephen's new site...I didn't know where he went after his issues with google or blogger. Had to go offer my apologies for missing his A-Z so far. Thank you for the shout out on Flights of Fiction. I'm honored to be mentioned on the Ninja Captain's blog. And please forgive me for the late response. I'm only online M-W-F so I miss a lot of Tuesday - Thursdays posts. Holy Ren & Stimpy ref! I have to follow this blogger just because of the name!